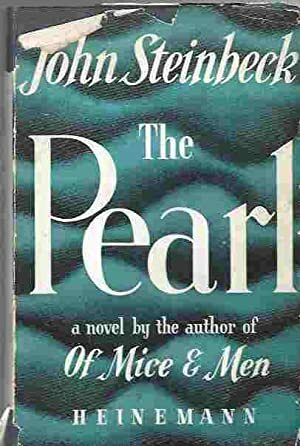 The Pearl by John Steinbeck was first published in 1947 and my copy seems to be a first edition, not that I bother about such things, it cost me all of £3. It’s a very slim volume, so I read it in no time at all – a bedtime read. It begins early in the morning in a shack in Mexico where Kino, a pearl fisher, and his wife Juana are just waking up. They have one child, a son called Coyotito, the centre of their lives, so when he is bitten by a scorpion they’re panic stricken. They have no money to pay for a doctor and hope that Juana’s swift action in sucking out the poison will save the child. But Juana still wants to go to the doctor to make sure, the doctor isn’t much better than a quack and he’s not interested in helping the child of peasants who don’t have money to pay him. Kino is desperate to find a large pearl, thinking that that would solve all of their problems, but when miraculously he does find a huge pearl it brings out the worst in just about everybody around him. This is a story about greed and envy which was apparently based on a Mexican folk tale. It’s not exactly uplifting and I can’t say that I really enjoyed it much, in fact it’s quite depressing, but no doubt it’s quite realistic in its portrayal of human character. 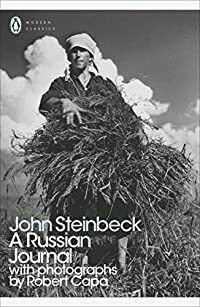 A Russian Journal by John Steinbeck with photographs by Robert Capa was first published in 1948, and it was 1947 when the two men teamed up to go on a tour around the Soviet Union, speaking to and photographing the ordinary people in their homes and communal farms. The Soviet people suffered horribly at the hands of the German army and whole areas were piles or rubble with people living underneath the ruins, in what had been the cellars of their homes. I find it quite amazing that they were allowed the freedom to visit people in their homes and of course they did realise later that the authorities were keeping an eye on their movements. The people were universally welcoming, particularly in the countryside where food was easier to come by and massive feasts were arranged for them and of course an awful lot of vodka was drunk. They noticed that the people in Moscow didn’t seem to have much in the way of a sense of humour but outside that area and particularly in Ukraine and Georgia the people were very different, I suspect that that has something to do with the different climates as much as anything else. So many men were killed during the war that it was unusual to see any men of working age at all, and any there were had often had amputations. The women had to take over the heavy work, but they were just glad that the war was at last over and peace was what was on their mind. They longed for a lasting peace but seemed to fear the west wanted to make war. This book shows that the ordinary Soviet people are like people everywhere, living in hope that things will improve and fearing they might get even worse. They are/were just like the rest of us. Steinbeck mentions that he and Capa missed the mascara and lipstick that the women back home wore, no such fripperies adorned the faces of the Soviet women. I’m fairly sure that make-up was very much frowned on from the beginning of the Russian Revolution. That’s something that was very different from the attitudes in Britain, especially during World War 2 when Churchill said it was a woman’s patriotic duty to make the best of her appearance, for her own morale as well as the men. This book is a really interesting read but I was quite disappointed that it has comparatively few photographs, considering that Robert Capa took thousands of photos. Sadly Capa died in 1954 when he stood on a landmine when he was covering the First Indochina War. When I was growing up in the 1970s the Iron Curtain was very much still drawn and it seems to me that over the years from just after the war to the late 1970s things must have got harder and harder for the Soviet people instead of improving. Certainly we were always reading of food shortages and when Jack visited Leningrad in the 1960s he noticed that all the children wore clothes that were far too big for them, obviously they were expected to grow into them over the years. I did quickly flash a photo of a tank and asked him if it was Russian and he instantly said – It looks German, but it’s probably a self-propelled gun. Is it a bloke thing? or is it a war history buff thing? I wonder. In Dubious Battle by John Steinbeck was first published in 1936 at a time when things in the US were still pretty desperate, before World War 2 kick-started the recovery from the Great Depression. I have to say that I had never even heard of this book, but as I enjoyed reading East of Eden recently I thought I would see what else was available at the library and this one popped up. In Dubious Battle is the first of three books that he wrote on labour issues in California, the other two being of course Of Mice and Men and The Grapes of Wrath. In 1935 Steinbeck had a very tough time of it when he went to New York looking for work that just wasn’t there so he knew first hand how difficult it was for a (non) working man. In Dubious Battle tackles the issue of itinerant farm labourers, specifically apple pickers. By the time the apple pickers had made their way to the farms by train the rate of pay had fallen. The farm owners are taking advantage of the situation, knowing that the men are just about on their knees. Jim Nolan is a young man who has had a tough time, beaten by cops and then jailed for vagrancy when he had only stopped to see what was going on at a labour meeting. Whilst in jail his mother dies, the system has just about defeated him. He feels that the unfairness of life has to be re-balanced and so decides to join the Party. 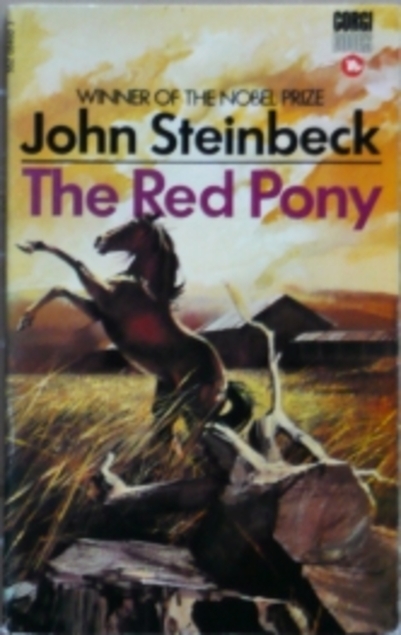 It isn’t specified as the Communist Party, I suppose Steinbeck thought the book was going to be controversial enough. Jim is an intelligent chap and impresses the Party leaders so it’s not long before he is taken to the fruit farm to mingle with the disgruntled workers. The Party wants to make the workers come out on strike so Jim and the others set about manipulating the men and then go to work organising everything. It’s only ever going to end in disaster and the Party bigwigs know that. In reality the Party guys are no more interested in the ordinary working people than the landowners are. The small guy is expendable as far as the Party is concerned. Apparently Steinbeck was interested in the psychology and behaviour of crowds and how they react to certain situations, he has the Party men manipulating everything and it’s clear that Steinbeck is no more enamoured of the Party members than he is of the landowners. Amen to that, I love Steinbeck. The next book of his I’ll be reading is A Russian Journal. The Moon is Down by John Steinbeck was first published in 1942.It was Steinbeck’s reaction to what was going on in the world at that time, although written before the USA had entered World War 2. The setting is a North European country which has been overrun by an anonymous enemy. Somehow Steinbeck was able to put himself in the position of the people who had been invaded by aggressors in the war, and so he tells of how the population behaved towards the invaders. It’s not long before everyone realises that they had had a traitor in their midst and the man they thought had been everybody’s friend had actually been working with the invaders, giving them the details of who owned a firearm and where it was kept, and other sorts of useful information. The Nazis are never mentioned in the book but the invaders refer to The Leader and it is mentioned that they had fought Belgium and France twenty years previously. 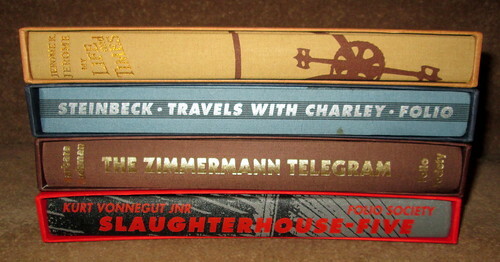 Steinbeck wanted to write a propaganda book, but something subtle rather than a rant. His German soldiers are human and they hate that they are despised by those they have overcome. 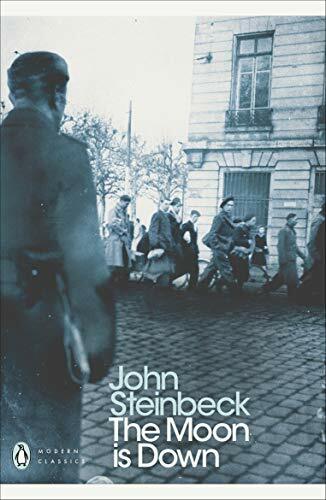 Steinbeck worked for two organisations who were precursors to the CIA and as part of the work he was involved with a lot of refugees, first from Norway and Denmark, then France, Belgium and the Netherlands as they were invaded. From the refugees he learned how the Germans behaved and about collaborators and the punishments meted out to those who were caught working against the Nazis. All the information helped him to write this book. The Moon is Down is very similar to Island at War which was an ITV series about the Nazi occupation of the Channel Islands. I’m sure whoever wrote that must have read this book. I must admit that I had never even heard of The Moon is Down until I spotted it at the library last week, but that was obviously some sort of weird gap in my knowledge because the book has an amazing history. The Germans banned the book in every country they occupied, a member of the Italian resistance reported that being found in possession of the book meant an automatic death sentence. Despite that hundreds of thousands of copies of it were translated and circulated in Norway, Denmark, Holland and France, it was the most popular work of propaganda in Western Europe. In Copenhagen a bookseller bought a mimeograph machine and churned out 15,0000 copies of the book, on the ground floor of a building. The Gestapo HQ occupied the rest of the building – talk about being hidden in plain sight! The bookseller even cajoled Gestapo officers into helping to load the books for delivery by students – resistance workers. How the Gestapo would have screamed if they had realised what they were loading! In the beginning the Nazis were keen to keep on the good side of the Danish people, but that obviously didn’t last. It must have been so satisfying to Steinbeck that the book was so well received by those who were overrun by the Nazis because when the book was first published he was criticised as being too soft on the Nazis as he portrayed them as human beings, but that was what made The Moon is Down so successful. It’s an interesting and good read and I read it for the Classic Club Challenge. I’ve just realised that I’m a day late doing this post for the Classics Club Spin number 11, particularly annoying as I finished reading John Steinbeck’s Cannery Row about a month ago. The book was first published in 1945 but the setting is Monterey, California during the Great Depression. Cannery Row is a street full of sardine canneries, as you can imagine it isn’t the most salubrious of places. It’s smelly and the local workforce is mainly single men who need their comforts so there’s a local brothel which is owned by Dora Flood. She seems to be propping up the whole community as she is so heavily taxed on the whorehouse earnings. She takes great care of her girls, a madam with a heart of gold. Lee Chong owns a grocer shop, he’s ever on the lookout for a business opportunity but at the same time he’s very easy going and is owed a lot of money from various customers. When a group of local men led by Mack hear that Lee Chong has become the owner of a warehouse they decide that it could be the perfect home for them. When they suggest to Lee Chong that they move in there he thinks it is best to go along with their wishes as otherwise they will probably destroy the warehouse anyway. The guys are well known troublemakers, not so much because they’re evil but they are so immature and stupid that even with the best of intentions everything they do ends in trouble for other people. Mack and the guys have evolved the prefect life/work balance for themselves, only working enough to be able to pay for their immediate needs and dodging work otherwise. Doc is a marine biologist and lives just across the road from the grocery store. He lives by gathering marine specimens and sending them to various universities to be examined, as well as carrying out experiments himself. He’s also seen as being the local medical man although he’s unqualified, and he’s happy to patch people up when they need it. Mack and the boys get it into their heads that it’s about time that they showed Doc their appreciation of him and they plan to give him a surprise party. You just know it’s going to be disastrous. I really enjoyed Cannery Row, it’s funny and has a cast of likeable characters. It’s also a very quick read, just a novella really, but now I want to go on and read all of Steinbeck’s books. I’ll have to add them to my Classics Club list. Of Mice and Men by John Steinbeck is one of those books that I was pretty certain I had read as a youngster, but recently realised that I hadn’t, so I rectified it fast. In fact my copy of the book is in a volume of Steinbeck which contains this one and Cannery Row. I got Cannery Row in the Classics Club spin, so more on that one early next month. Of Mice and Men is a quick read, just a novella really, it was first published in 1937 and the setting is close to Soledad and the Salinas River, California. 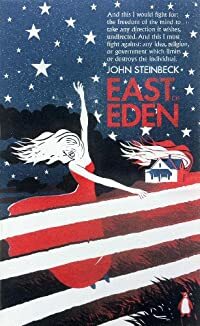 It’s the American Depression and is based on Steinbeck’s own experiences of being a bindlestiff in the 1920s, a sort of itinerant farm worker. George and Lennie are travelling towards their next job on a farm, they’ve had to leave their previous one due to a misunderstanding involving Lennie and a young woman. Lennie is a big man who has the mind of a small and simple child and it gets him into trouble, especially as he doesn’t have any idea of just how strong he is. George is really Lennie’s carer, trying to stop him from getting into trouble, no easy task. Lennie loves to feel soft things, and he had a piece of velvet which someone had given him to stroke, but sadly he lost it. A teeny mouse was fulfilling his tactile needs, but due to having no idea of the fragility of a mouse and what his manhandling it will do to it, it isn’t long before the mouse is dead. Lennie just can’t understand it. When they reach the farm where they have some work, they’re looked on suspiciously, it’s unusual for men like them to travel around in pairs, they’re usually loners, and it’s thought that George might be taking advantage of Lennie and taking his pay from him. It’s not true of course, although they both share a dream to own some land and a home of their own. They have it all planned out. They begin to get to know the other workers and Lennie is ecstatic when he is given a pup from a newly born litter on the farm – oh dearie me! This is a sad tale, you know it’s just not going to have a happy ending and Lennie ends up suffering the same fate as an ancient farm dog. The best laid schemes o’ Mice an’ Men gang aft agley. The best laid schemes of mice and men go often awry/askew. Well the Classics Spin number is 19, which means that I’ll be reading John Steinbeck’s Of Mice and Men. I’m very happy about that. I’ll be reading it by February 1, 2016. How did we get to 2016 so fast – it’s scary! I intend to read some more of the classics on my list before then though, almost certainly a Trollope or two.